Other people had tomatoes WEEKS ago, some MONTHS! We live in an area where the growing season dictates setting one’s tomato plants out on Memorial Day. Its been quite a rollercoaster ride with endless weeks of dark rainy days and then now drought conditions (it turned around so fast). Our trees are now already in a good fall color, WAY too early. If you are thinking about coming to central Massachusetts on Columbus Day for peak fall colors, you will have missed it! Back to my own little ecosystem. We are simply awash in organically grown red gold. We have some mega beefsteak tomatoes that are stupendous if not grown from organic seeds (but organic thereafter). We have many organic heirloom tomatoes from Seeds of Change that are yielding well. We are eating heirloom Arkansas Travelers, Yellow Perfection Pears, Calabash, Burbank, and Brandywines. I also planted “variety” salad tomatoes that are yielding a confetti of orange, red, and yellow cherry, grape, and pear tomatoes! Our tomatillos are starting to fill out so I am looking forward to roasting some up and making a Rick Bayless recipe for roasted tomatillo salsa (see this blog post – Pre-constructed tomatillo salsa). We are eating tomatoes at every meal now. 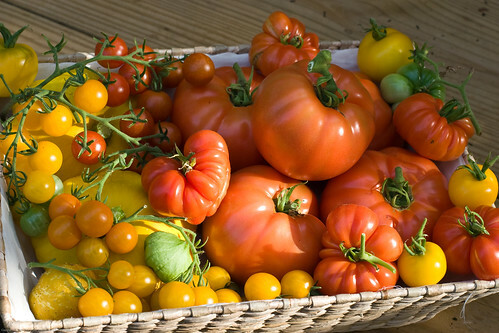 A big part of me wants to have us eat all of these fresh, now, at peak flavor and nutrition instead of canning them. One nice way to “dress up” a tomato for a meal (if you should feel the need) is to make a tidy little tomato tart out of it. I chose a heart shape because I was also shooting to make a logo for the Share Our Strength‘s Great American Bake Sale (you may have seen it in my side bar last week). 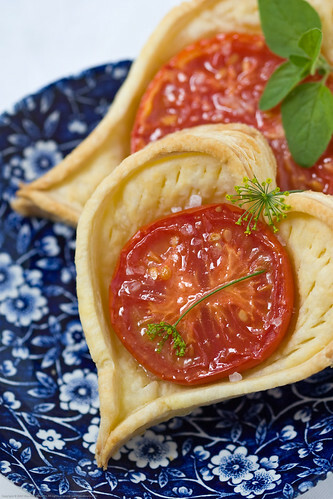 I simply used store-bought puff pastry and made little heart shapes. I scored the interior part of the heart to be sure it didn’t puff up too much. I sliced some tomatoes and put it on the raw dough. I roasted/baked these at 400F until the color was right on the dough (time totally depends on your oven!). 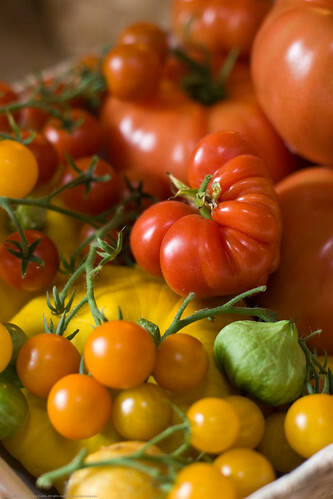 Really great looking produce, as expected… The tomatoes look about perfect. OMG, the tomato tart is so pretty! Curt: as expected! Yikes! The tomato goddess does as she pleases. 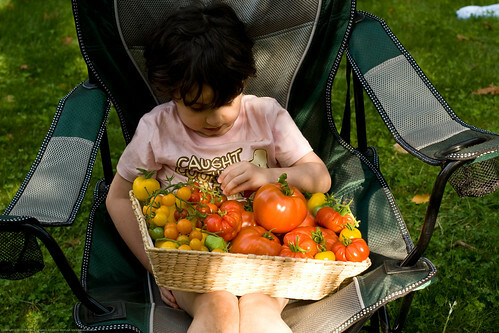 I feel so lucky that she is allowing them to ripen now. I guess the darn plants LIKE drought like conditions… go figure! Anh: glad you liked it! I didnt even get to taste it. My husband asked if he and one of the kids could have a bite as I was packing up my tripod and next thing I knew they were all gone, zip! Hi Nika, looks like you’re right in the middle of garden heaven around here. All the photos look great, as usual. Thanks for your nice comment on Epicurious about me, what a thrill to be mentioned on there. Kalyn: yes indeed, it was great to see you mentioned there! Tomatoes are awesome little culinary models, am enjoying shooting them. 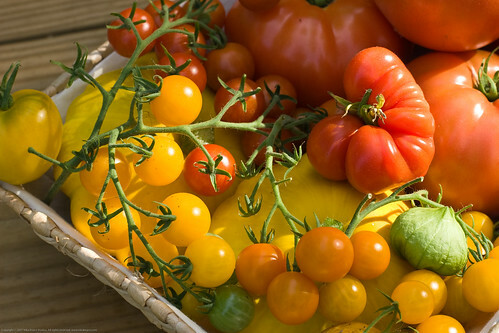 Did I spy some lemon cucumbers along with those tomatoes? A friend has them in her vegetable garden, and if I’m very lucky, she adds a couple to the bag of tomatoes she gives me every summer. 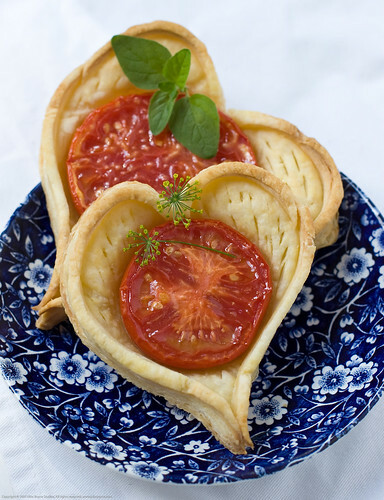 I love your heart-shaped tarts — so beautiful. yes! Those are lemon cukes. They are growing so much better than the regular green ones we are also growing. They are great tasting and also great for growing vertically as they do not get too heavy for the vine. Glad you like the tarts :-). Nika, sorry for ur privacy. I already removed ur photo from my blog. anyway, U have nice photos.